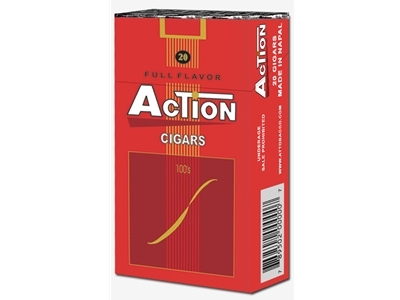 Action Full Flavor Filtered Cigars uses a blend of great quality, yet mild tobacco that gives it a great, smooth flavor. Each Action Filtered Cigar is wrapped in a natural tobacco paper which offers a smoker the satisfaction of an all-natural taste and flavor each and every time. Each carton is available in Soft 100's and packaged 20 cigars per pack, 10 packs to a carton for a total of 200 premium filtered cigars. Just like cigarettes!